Why should we care about Indian villages? One in eight of the world’s population lives in an Indian village; India’s 600,000 villages contain more of the world’s people living Below the Poverty Line than the whole population of Brazil, as well as one third of the world’s malnourished children. Why is this? Because, despite the awesome scale of India’s social statistics, successive Indian governments and Five-Year Plans have failed to give rural India the support and priority which its huge population needs and deserves. This is our starting point. Can we guess what rural poverty means in India? Sunshine, smiling women in bright saris suggest a wonderful, or at least acceptable, quality of life. Don’t let us fool ourselves: rural poverty in India is grinding. It means, especially for women, miserable access to water & sanitation, nutrition & health, knowledge & education, work & income in a still caste-ridden, male-dominated society. 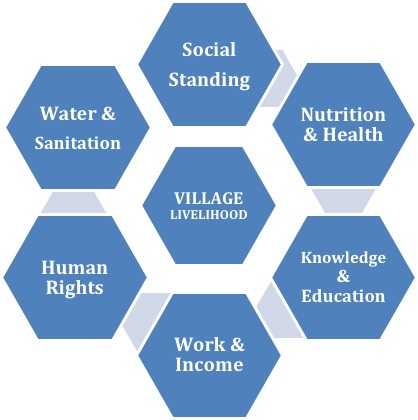 This is what we work to alleviate, and this is what shapes our ‘Village Livelihood Model’. 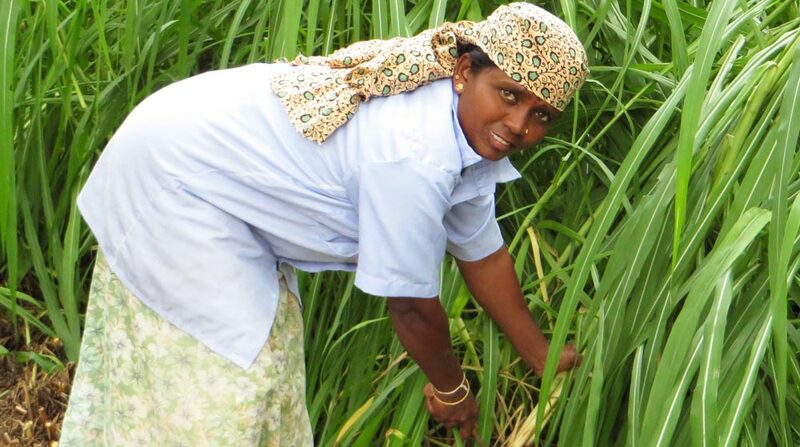 These SIX issues, according to our experience, are those which primarily shape and determine village women’s lives, and their hopes of moving out of Poverty towards Well-being, through the Livelihoods which we seek to offer them. Today’s women and tomorrow’s women – half of rural India’s 800 million population – are also rural India’s greatest untapped resource: they respond to literacy, education and empowerment: they are at the heart of our village livelihood model and rural India’s future. Children of all ages depend on family, are affected by all these issues, and benefit directly from family well-being: tomorrow’s women are today’s girls of whom over 20% drop out of school at puberty due to lack of toilets and privacy; women also suffer from the indignity associated with the lack of toilets and privacy. Menfolk are still seen as natural heads of family and community, but too often their earnings are seasonal, unreliable and not shared with family while too often they disable and discourage their women from meaningful livelihood activities. Village communities are, with notable exceptions, still predominantly led by men, while women’s capacities and skills are largely blocked from decision-making and village-level processes and their human & legal rights marginalised. 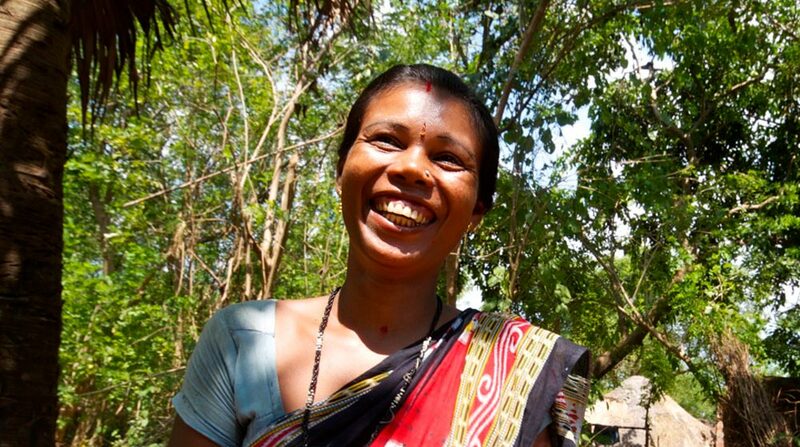 Poverty disables women in village India – but that doesn’t just mean not having any money. Below we have tried to illustrate the factors that disable women across six key aspects of life in village India, as well as how the livelihoods we support address each issue & enable women to experience greater independence, respect & overall well-being. The ultimate goal of JEEVIKA’s livelihood model is to build both the conditions for village livelihood and the capacity of village women, so that they may engage fully in socio-economic life. 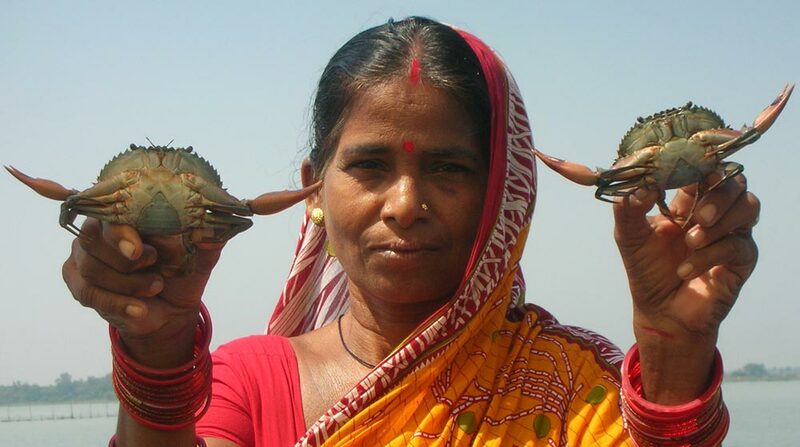 In this way, women become empowered to sustain income-generation activities, work in Self-Help Groups, gain self-esteem and the respect of their menfolk, engage in village decision-making, provide role-models for their children, and become fully in charge of their own well-being and enabled to contribute to the quality of family and community life. These outcomes cannot be always guaranteed, and there are other necessary ingredients for well-being such as energy, transport, social services, etc., but they do offer clear personal and family goals for half the population of rural India which Jeevika is dedicated to support.